Get this printer for free through the Xerox Small Office Savings Plan. Save 10% on supplies with your VersaLink C400 purchase (available at checkout). Powerful performance and peace of mind. Right out of the box, you'll count on the VersaLink C400 color printer to consistently and flawlessly perform the tasks that make your business work more efficiently. From IT-free installation wizards, to step-by-step configuration options, you're ready to go—hassle free. The Xerox® VersaLink C400 printer is loaded with features and time-saving Xerox technologies designed to speed up information sharing and reduce inefficient workflows. When it comes to safeguarding critical documents and data, the VersaLink C400 delivers a spectrum of stringent security features, including Secure Print and card authentication to control access. With the VersaLink C400 color printer, you can be confident that your documents will look their best—making you look your best—giving you the confidence you need when presenting to your customers. With the customizable, capacitive 5-inch color touchscreen, you can tap, swipe and pinch your way through tasks and functions with mobile-like ease. 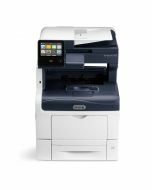 Available Xerox® ConnectKey® Apps help optimize office efficiency, and on-screen access to the extensive Xerox® App Gallery provides expanded functionality. Speed through tasks by saving common settings as presets for simple, single-touch job setup. With Simple ID, individual users and groups enter a user ID and password once, and then enjoy fast, secure, easy access to task-specific presets and commonly used apps on a personalized home screen. The VersaLink C400 gives you the freedom to work where and how you want—with available connectivity to Google Drive™, Microsoft® OneDrive® and DropBox™, and access to additional options through the Xerox® App Gallery. 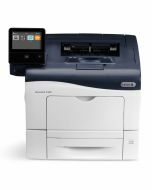 The ability to connect and print from multiple devices is key for today's worker, and the VersaLink C400 color printer meets the challenge with optional Wi-Fi and Wi-Fi Direct, plus Apple® AirPrint®, Google Cloud Print™, Xerox® Print Service Plug-in for Android™, Near Field Communication (NFC) Tap-to-Pair and Mopria®. Product Size Dimensions (WxDxH): 19.3 x 19.2 x 15.7 in. ; Weight: 57 lb. Media Sizes Custom sizes: 3 x 5 in. to 8.5 x 14 in.